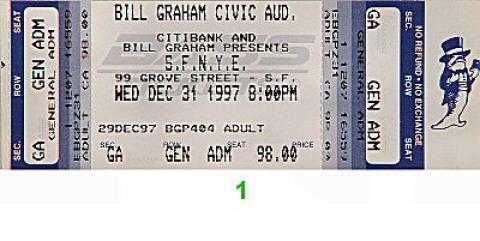 Boz Scaggs and Chris Isaak headlined an enormous New Year's line-up at the Bill Graham Civic Auditorium in December, 1997. A big draws for this fiesta was that it was held completely under roof but still offered all the trimmings; balloon drop, cocktails, dancing girls and fireworks. One of the evening's more interesting performers was Buckwheat Zydeco, a Cajun-style zydeco combo led by keyboardist/accordion player Stanley 'Buckwheat' Dural.